For the second night running Rawpromo have a sell-out crowd for the acts they are promoting at The Flowerpot. 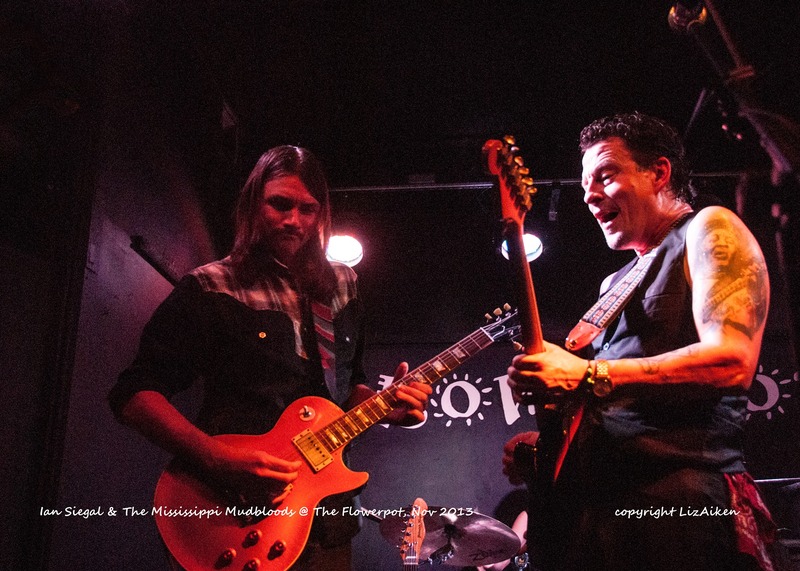 Tonight the chatter was about Ian Siegal and the many guises he performs in and our favourite – tonight with the Mudbloods it was going to be swampy country blues delivered in Siegal’s own award winning and importantly crowd pleasing style. Tonight the Mudboods are a little bit different as ever Cody Dickinson is the stalwart master drummer full of flare, rhythm and gets the heat of the drums sounding out on the beat and adding a percussive type of sound; joining him on bass, vocals and sometimes lead guitar is fellow North Mississippi Allstar member Lightnin’ Malcolm and the third member Duane Betts on guitar producing a delightful rootsy rock sound the scene is set now for the music; they are described by Ian as the “Golden Ratio”. It was a medley of the latest tracks from “The Skinny” & “Candy Store Kid” albums, delighting the audience as they love these tracks kicking off with ‘Kingfish‘, ‘I am The Train’ and a real good time ‘Picnic Jam‘; which got the vibe going and told everyone they were here for a good time, of zinging live music that will not be boxed and served up as aficionados of genres expect. It is all the better for that with music that has a free-form; full of great licks, superb lyrics and all instruments complimenting each other, this is live roots, blues country music at its best. Ian, as ever quickly built great rapport with the loud and excited audience and the interaction between the musicians on stage showed they enjoyed each other’s company and were here to play and have fun. Lightnin’ Malcolm took centre stage on lead guitar for a couple of numbers allowing anyone in the audience who has not heard him before to listen to his beautiful vocals, great guitar skills, he is a great songwriter and his solo album, “Rough Out There” is anything but rough! The opening track of the album ‘Workin” really suits his voice and guess who filled the gap as bass player! Why the multi-talented Ian Siegal who now adds another string to his bow as a pretty mean bass player. Ian Siegal and The Mississippi Mudbloods - Flowerpot - Nov 2013_0248l Then another swap round of instruments and the set list played on with the songs we all love including ‘So Much Trouble‘ written by Lightnin’ Malcolm and tonight sung and played by Ian who demonstrated what a great wordsmith Malcolm is. This was a stage of four equally talented musicians and this shone through on every track. Duane’s silky guitar licks added a different tone to the sound with a rocky edge firmly planted in swampy southern blues sound and the interaction between his and Ian’s guitar was special and this duo has the potential of being something exceptional – we want to hear more. Ian Siegal and The Mississippi Mudbloods - Flowerpot - Nov 2013_0294lWhat has now become a bit of a signature number when Ian plays with a band is the tremendous track ‘Hard Pressed’ from his “Broadside” album; he breaks of to do a tribute to Prince with snippets form various Prince tracks around the main thread of ‘Sign O’ The Times‘ then effortlessly back into ‘Hard Pressed’ showing the adept mastery of Ian and the band shaping and re-interpreting the tracks you love so you are always kept on your proverbial listening toes! The music played on and the lyrics washed over the appreciative audience and all too soon they were leaving the stage, an encore and then the stage fell silent and the audience reflected in the stupendous show of live music they had just had the privilege of witnessing. Ian Siegal’s stylish playing reminded everyone who loves the modern blues scene that he is definitely the best Blue’s performer this side of the Atlantic – Ian is the A.P. McCoy of British Blues and we want to see him time and time again in any of his guises, none of them boring as he produces the full spectrum of musical colours and textures for our delight.